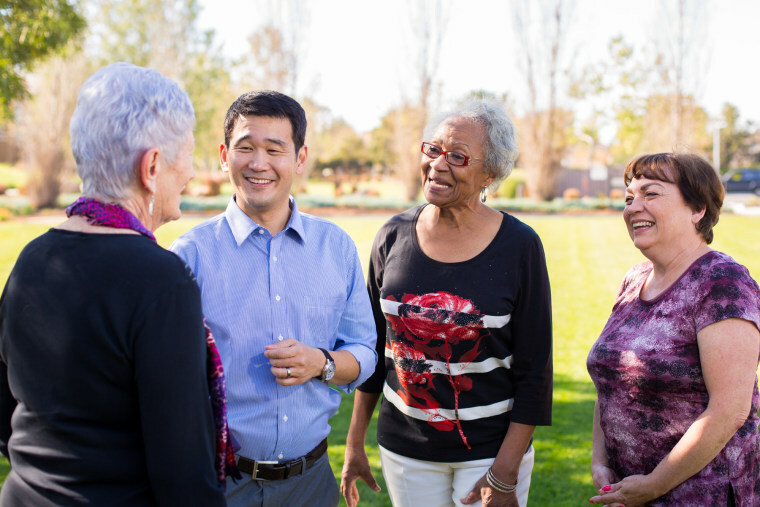 When Dave Min was growing up in the San Francisco Bay Area, he was told on occasion that he’d make a great politician one day. Min went on to earn a law degree from Harvard Law School before working in the Senate, but it wasn’t until President Donald Trump signed an executive order banning travel from seven predominately-Muslim countries that he and his wife — Jane Stoever, a fellow law professor — seriously thought about politics. Min, who teaches contracts law and banking courses at the University of California, Irvine (UC Irvine), is challenging incumbent Republican Rep. Mimi Walters in California’s 45th Congressional District, which includes Irvine and several other Orange County cities, in 2018. Home to more than 700,000, its population is approximately 24 percent Asian American and Pacific Islander. Orange County is traditionally Republican but went Democrat in 2016, with 49.8 percent voting for Hillary Clinton compared to 44.9 for Trump, according to the California secretary of state. Walters was reelected last year with 58.6 percent of the vote. The potential to flip the congressional seat has also attracted Min’s UC Irvine Law School colleague, Katie Porter, and Kia Hamadanchy, an Orange County native and fellow former senate staffer, to enter the race. “There are so many fundamentally wrong and un-American things that this administration does and condones, and Mimi Walters is endorsing them, or being quiet, and that makes me angry,” Min said. Min has not been shy about calling out Walters on Twitter for residing outside of the district and not holding public, in-person town halls. Min believes there are plenty of Republicans in the district who are not racist or xenophobic, and are just as bothered by the administration and Walters, he added. Walters' office disputed those criticisms. “A top priority for Congresswoman Walters is community outreach and meeting with her constituents. Since she was first elected to Congress two-and-a-half years ago, she has held dozens of community coffees, and numerous in-person and telephone town halls," T.W. Arrighi, Walters' communications director told NBC News. “In fact, on May 1, Congresswoman Walters held a telephone town hall meeting in which tens of thousands of constituents participated and provided invaluable feedback on the issues most important to the district," he added. Min traces his passion for fairness and social justice to being the son of Korean immigrants who arrived in New England in 1972 to pursue doctoral degrees at Brown University. Min said that UC Irvine — and the United States — is seeing reduced numbers of immigrants from places such as Pakistan, India, and China. “We’re not just losing people who are affected by the Muslim ban. It’s problematic because these immigrants are helping to drive the economy,” he said. The murders of South Asian Americans, racist rhetoric, and crimes against people of color are some of the reasons talented immigrants are choosing to go elsewhere, according to Min. His desire to make life better for Americans crystallized in his early 20s, Min said. After law school, he weighed offers from Goldman Sachs and the Securities and Exchange Commission (SEC), he said. It was a choice between financial security and public service, according to Min. He ultimately chose the SEC, where he worked alongside the FBI to bust up boiler room fraud operations and learned the value of government regulators who protect “the little guy,” Min said. He later worked in securities litigation at WilmerHale, a Washington law firm. A self-described “policy nerd,” he entered the political sphere as banking committee counsel for Sen. Chuck Schumer (D-NY). When Schumer was made chair of Congress’ Joint Economic Committee in 2007, Min became his senior policy adviser and later, deputy staff director of that committee. Prior to shifting to academia five years ago, he was an associate director for financial markets policy at Center for American Progress, a left-leaning think tank, where he oversaw housing reform. Min believes that the country has been going in the wrong direction for years. As my kids point out, "Daddy's gotten a lot more gray hairs since Trump became President." It's only been 118 days since he took office. He worries about climate and the environment, and wonders if there will be future wars over water, clean air, and food. “These are concerns we didn’t have to grow up with,” he said. If elected, Min wants to address these issues, and hold the president accountable when necessary. “If we don’t stand up for people who are being targeted right now, we will be next. It’s not a partisan issue." While he was never shy prior to Trump’s election, Min said he was more reserved then than he is now. With a little over a year to go before the June 2018 primary election, Min said he’s already getting less sleep and misses seeing his three young children as often as before. “They were just asking me, ‘When are you going to be done with running for Congress?’ and I said, ‘Oh, we just started,’” he said.